When I started on the idea for this puzzle at the start of 2013, my first grid produced a very simple concertina-like staircase. 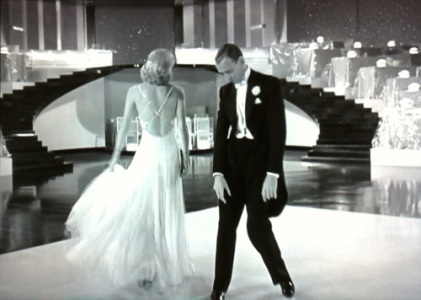 When observed from above, the message FRED ASTAIRE & GINGER ROGERS appeared in six columns on the treads of the stairs. I was unhappy with grid for a number of reasons and I’m glad I abandoned the idea because, as it turned out, Homer’s excellent puzzle ‘Going Out in Style’ used the concertina concept in a much more thematic way than my puzzle and I’m sure the editors would not have accepted two such similar ideas. In Swing Time, Fred and Ginger dance up their respective halves of the double staircase so I knuckled down and set about producing a structure that would permit that to happen in a 12×12 grid. I also wanted the film title, the name of the night club and ORIGAMI to appear. I eventually hit upon the cut and fold design for the staircase that you have seen but I wanted solvers to find the diagonal lines to make finding the names on the staircase more of a reveal. My first published puzzle appeared in the excellent Magpie magazine. It was called ‘Smith’s One’ and used the idea of diagonal lines to separate clashes so I thought I would try it again. I don’t know of any crossword producing software that is capable of handling this restriction so both that puzzle and this one had to be produced by hand on squared paper. I produced a grid I was happy with sometime in February 2013 with jumbled ORIGAMI in a ‘two-step’ pattern (mentioned in my original preamble as a hint for dancing and stairs but cut due to lack of space). I then discovered that this type of cut and fold design is called KIRIGAMI so I made a small change to the grid in the top right to include the necessary K (in OKRAS) in case I decided to use that word (at the expense of the two-step hint) rather than ORIGAMI. Only one solver commented that the word should have been KIRIGAMI (in Collins and Wikipedia but not Chambers or ODE). Well, the preamble did say that only the instructions from across clues (the two types of fold) were related to the letters jumbled in ringed cells. It was the down clues that produced the instruction to cut. One solver also queried the staircase design. It is true that the double staircase appearing in the film is slightly more open at the bottom than the top but I needed the extra steps to have Fred and Ginger appear on the treads. The barred-off cells in conjunction with the ampersand sign were meant to be a help in determining the start and end point of the names, but also provided a useful way to ensure solvers had found the theme. The half-way platforms on each staircase were necessary to keep the grid together after the cuts were made. In fact, my first tiny model only had three rows in the centre giving a slightly better staircase and more room for the top platform where I was going to have Fred and Ginger swirl round one another, but the grid looked better with the dots, dashes and diagonals being symmetrical and I thought the symmetry would make what was going to be a tough puzzle easier to solve. Many solvers mentioned ambiguities in the position of the diagonals, particularly in the NW corner of the grid. None of this was intentional. But all doubt was removed with the discovery of the symmetrical nature of the final grid and the need to locate the stars. A few solvers came up with another solution to the second clue. Girl comes back with fine vegetables (5) giving FLORA — [C]AROL< + F. But some admitted FLORA was not well defined by vegetables and the emerging message eventually discounted all but the correct OKRAS (SARA< after OK). The puzzle went to the Listener editors in May 2013. Because of the necessarily large number of clues (to provide the instructions), the preamble was shortened and improved and I came up with some new clues to remove two ambiguities in the extra letters that I had missed and a few other refinements to avoid repeated use of words in clues. The puzzle just squeezed into the paper but needed a reduced font size for the clues. I must thank the editors Shane Shabankareh and Roger Phillips for their help and encouraging feedback, Roger for the beautiful 3D solution which appeared online and in the paper and John Green for sending me your comments. Swing Time 2min 20s in to see the stars rise! Apologies for the delay in producing this requested blog but this really is the first opportunity I have had to produce it. This entry was posted on 14 December 2014 at 1:00 pm	and is filed under Setting Blogs. You can follow any responses to this entry through the RSS 2.0 feed. You can leave a response, or trackback from your own site. I did find ambiguities initially in where to put the diagonal lines, but they eventually went away and there’s no denying that the puzzle is a wonderful construction. Thanks, Ferret, for the puzzle and the setter’s blog.